"You cannot be healthy without oral health. Oral health and general health should not be interpreted as separate entities. Oral health is a critical component of health and must be included in the provision of healthcare and the design of community programs." And of course, those community programs should include access to oral health services for all. However, there are two primary obstacles to receiving dental care in the US: cost and accessibility. As untreated dental issues progress, many underinsured and rural people with severe dental problems turn to emergency rooms for pain relief. However, ERs are not properly equipped to treat dental issues. To combat this issue mobile dentistry programs provide free or low-cost urgent dental care services to underserved populations in rural, urban or even school locations. And schools can be the most important. Good oral hygiene starts with kids. There is a significant need to extend mobile dental care in educational settings such as preschools, Head Starts and K-12 schools. 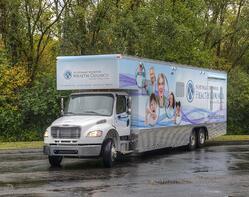 Many school dental services are provided by mobile dental clinics which park at the schools. These mobile medical units are uniquely customized dental offices on wheels and can be from 20 to 75 long, depending on the needs of the providing institution or dental practice. According to The Association of State and Territorial Dental Directors (ASTDD) there are four common school dental service models. Each of these can be easily served by mobile dental units. School-based or school-linked basic preventive and restorative dental services at any grade. Many Federally Qualified Health Centers, State Oral Health Programs, hospitals, non-profit groups and universities have implemented mobile dental services to increase their outreach to rural communities and schools. Among the other organizations listed above, a Federally Qualified Health Center plays a very important role. A Federally Qualified Health Center (FQHC) is a reimbursement designation from the Bureau of Primary Health Care and the Centers for Medicare and Medicaid Services of the United States Department of Health and Human Services. As when providing any healthcare service, patient follow thorough is the key. According to Lesa Peterson a Director at FQHC Germane in Southwest Florida “If a program is only going to provide preventive dental services, it is imperative that there is coordination and referral systems in place so patients have a "dental home" for ongoing care and that services are not duplicative. By not following through with continuity of care, you risk losing community support which is crucial to a mobile program’s success.” While providing a continuity of care, this also helps the individual FQHC program protect their service market area. OneWorld Community Health Center is an FQHC in Omaha, NE which cares for young children, adolescents, teens, adults and seniors. 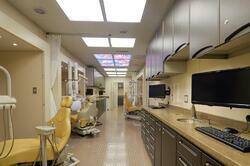 They operate a 2-operatory Ronald McDonald Care Mobile® (RMCM) dental unit. This Care Mobile dental unit is a partnership with Ronald McDonald House of Omaha and visits area schools to provide pediatric oral health care. Beaufort-Jasper-Hampton Comprehensive Health Services (BJHCHS), is a FQHC in Ridgeland, SC, and is one of the largest and most respected health care providers in the state of South Carolina. BJHCHS has been operating a Ronald McDonald Care Mobile unit since 2001 that is still on the road. In 2015 they began to operate another combination mobile medical-dental unit serving rural communities and schools. Commwell Health an FQHC in Newton Grove, NC rolled out a new Mobile Dental Unit in June, 2017 to serve students in the Johnston County Public Schools. The Community Mobile Dental Clinic Program “KINSHIP was developed six years ago as a vision to bring mobile dental care to schools for children who would otherwise be challenged to go to the dentist.” said CommWell Health CEO Pamela Tripp. In November 2017 another FQHC in Kirksville, MO, the Northeast Missouri Health Council put a new 45 foot long mobile dental unit into service. A mobile dental van can have very different staffing requirements than a private practice. Most programs have a coordinator who determines patient eligibility, schedules appointments, conducts billing and is involved with community participants to provide outreach to the target populations. These mobile dental coordinators also submit claims, working on behalf of the patient with Medicaid and third party insurances. Mission Hospital Children’s Dental Program in North Carolina provides 1,500 preventive and restorative dental visits per year from two mobile dental clinics to 600 children aged 7-12, serving 46 elementary schools in 10 counties. The PRASAD Project is a not-for-profit organization committed to improving the quality of life of economically disadvantaged people around the world. PRASAD Children’s Dental Health Program is a certified New York State Department of Health Article 28 clinic and school based health center, approved to operate in New York State schools using mobile dental care vehicles and portable dental equipment. Since 1998 it has served more than 62,380 children and provided more than 170,670 procedures. As stated above, providing a continuity of care also helps organizations protect their service market. The public necessity for mobile dentistry is extensive and grows every year. Mobile dentistry clinics provide much needed services to community outreach programs, schools, office buildings, retirement communities, factories and special events where people gather. Offering underserved populations and the general public with access to good oral health and routine dental care is a tremendous benefit for both the dental practice or hospital organization and the patient. By maximizing time with patients and providing responsive customer support to community institutions, such as schools, a provider secures their market position and enhances their reputation. In addition, when the mobile dental unit arrives at its location it is likely to serve patients all day. School aged children, the dental provider and the other sectors of the community all benefit from the services of a mobile dental treatment center. When backed by an effective marketing plan the return on investment is significant while considering the dental mobile clinic truck or mobile dental van cost. Not only from the billed services provided through the mobile unit, but also the referrals back to the institution (dental practice, clinic or hospital). To learn more, download our white paper which details Why a Mobile Medical Clinic Can Help Protect Your Market.